The Australian Cattle Dog (ACD), also known as the Queensland Heeler, Blue Heeler, and Red Heeler, is a herding dog developed in Australia for controlling cattle. It is a medium-sized dog with a lot of energy, intelligence and an independent streak. The precise origins of the "Blue Heeler" are not known, but they appear to have been a distinct breed as early as 1897. It began when Smithfields were originally used in Australia for herding cattle, but they were noisy and bit too hard, so they were bred with the Dingo, or wild dog prevalent in Australia, and were then called “Timmins Biters,” which were quieter, but still bit hard. Border Collies and Smooth-coated Collies, used for herding sheep, and the dingo were then bred with each other. In 1840, Thomas Hall bred a couple of Blue Smooth Highland Collies with dingoes and got the “Hall’s Heeler”. Then, in the 1870’s Fred Davis bred some Bull Terrier into them to make the dogs more aggressive. These were relatively common as sporting and guard dogs in the late 19th and early 20th century. 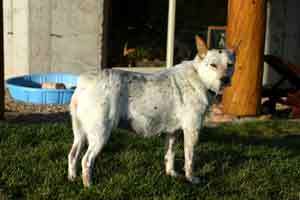 The resulting Cattle Dog was of a slightly heavier and more muscular build than the Border Collie and of less temperamental nature, with good herding ability, the stamina to withstand extremes of temperature and the resourcefulness to forage and to feed itself on an omnivorous diet like a wild dog. Physically the "Heeler" has inherited a big broad head and strong jaws from the Bull Terrier. From the Dingo comes the distinctive sandy colour of the legs, rather large pricked ears, and the tendency to regard a kennel as something to be sat on like a rock, or burrowed under, but almost never lived in, unless the rain is pouring down. Like the Welsh Corgi, the "Heeler" is fearless with cattle and has a tendency to nip their heels to keep them moving, when herding. This trait is undesirable when the dog applies to humans, and also to horses. In order to create a breed that had a strong natural affiliation with horses, the Cattle Dog was crossed with the Dalmatian, which although not a working dog, was popular during the 19th and early 20th century as a carriage dog, running beside the horses. The resultant dog was one which was friendly to horses and would work cooperatively with a horse, in a herding situation. 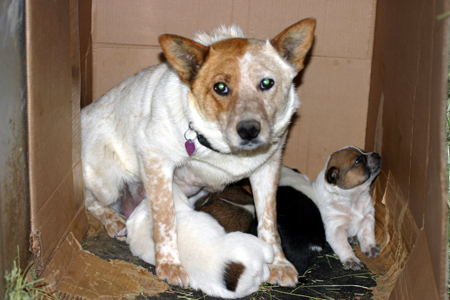 This breeding with the Dalmatian led to the spotted colouration valued in "Blue Heelers", the dark colour being the somewhat bluish black of the collie. 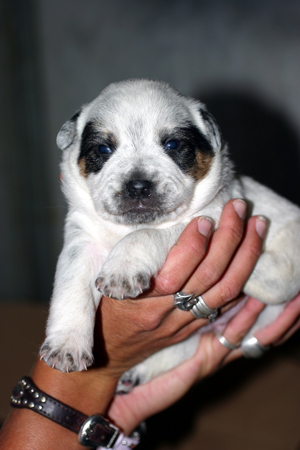 For many years "Blue Heelers" commonly had large black patches on the body, as well as the Collie's mask. It was also common for them to have ears that lay back against the head like some Collies. The flat ears are now considered undesirable for showing. A blue ACDThe Cattle Dog's coat comes in two basic colours (blue and red) and a variety of markings and coat patterns, sometimes quite striking. The solid blue coat has a bluish appearance, caused by the mottling of black, gray and white hairs all over the dog's body. The solid red coat is distinctly red, generally with some variable percentage of white hairs frosting the coat. With the exception of solid colouring for a mask or a few body spots, the rest of the dog is covered with hairs which are alternately coloured and white, like the hair on a roan horse. This roaning is also found in collies that are merle in colouration. But unlike merle collies, this colour in Cattle Dogs should not be accompanied by odd-coloured eyes and irregular albino patching. The coat of a cattle dog should show an even disposition of colour, save in the coat patterns of 'speckle' and 'mottle'. These two patterns (which show in both red and blue versions of the coat) are less common. A 'speckle' is a dark coat with a heavy roaning of white speckles, almost in a reverse spotted pattern. A 'mottle' is a light or white coat with regularly-placed denser areas of dark colour showing up as spots, inherited from the Dalmatian ancestry. 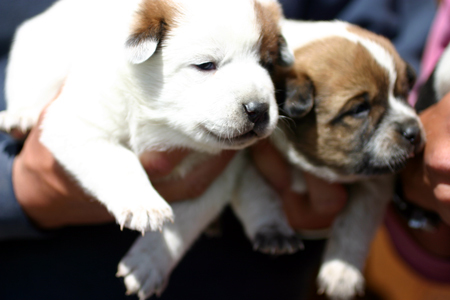 Both of these coat variations are considered unusual and uncommon, but acceptable by breeders. 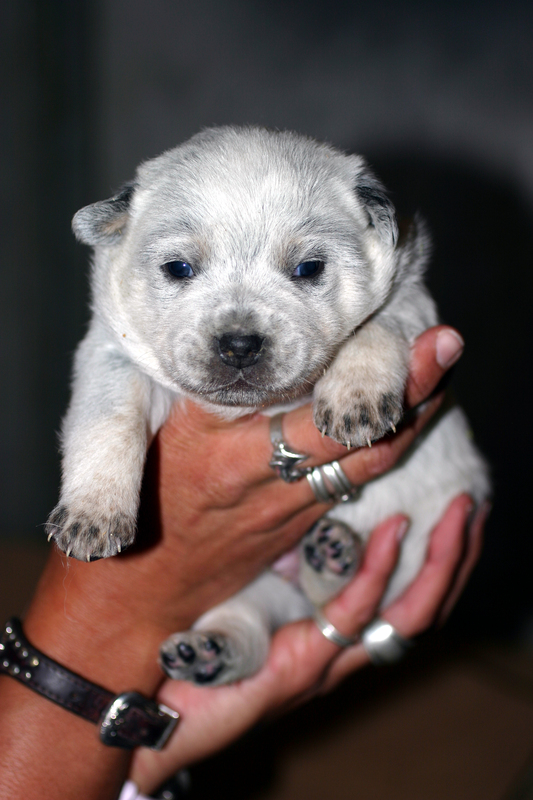 Cattle Dog puppies are born white (save for any solid coloured body or face markings) and grow darker as they mature. The preferred colour of the Cattle Dog is generally blue, with ginger feet, ginger spots on the legs, and some of the ginger colour on the face and underparts. The alternate, but dominant genetic colour is red. A red Cattle Dog should have no blue whatsoever, (although they can occasionally appear with black saddles -- this is a strongly disfavoured marking). Its body is flecked with red and white, its mask is red and if it has patches on the body, they are red also. Blue Cattle Dog with a single mask, showing red points, blue speckles and intelligent brown eyes of a good ACDFor dog owners whose interest is primarily in their qualification for conformation shows, even markings are preferred over uneven markings, and large solid-color marks on the body are undesirable. For owners who are more interested in their dogs' performance in activities such as herding or dog sports, the breed's strong work ethic and intelligence are of more importance than the exact coat markings. The mask is one of the most distinctive features of an ACD. This mask consists of a blue-black patch over one or both eyes (for the blue coat color) or a red patch over one or both eyes (for the red speckle coat color). The blue variety should also show some red on the face. Depending on whether one eye or both have a patch, these are called, respectively, single mask and double mask. ACDs without a mask are called plain-faced and may have small red "eyebrows". Any of these is correct according to the breed standard, and the only limitation is the owner's preference. Most Australian Cattle Dogs have a stripe or spot of white hair in the center of the forehead, usually 1/2 inch to 1 inch by 2 inches to 3 inches (about 2 cm by 7 cm) called the Bentley Mark. This is similar in appearance to the blaze or star markings sometimes found on horses. This mark can be traced to a purebred dog owned by Thomas Bentley. 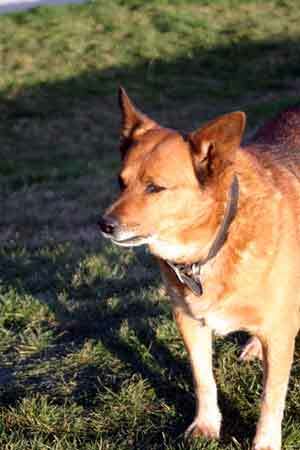 According to legend, a popular dog owned by Tom Bentley passed on this distinctive mark to all Australian Cattle Dogs. They also frequently have a white tip to the tail and a small white patch on the chest. 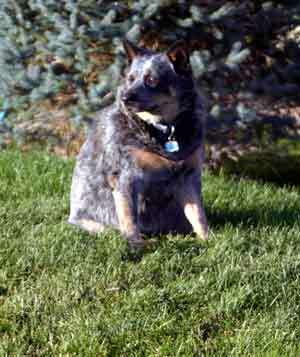 Handsome blue ACD with docked tailA female Australian Cattle Dog should measure about 17 to 19 inches (43 to 48 cm) at the withers. A male Australian Cattle Dog should measure about 18 to 20 inches (46 to 51 cm) at the withers. An ACD is a well-muscled, compact dog with a dense coat of coarse, rather oily hair with a slight ruff and fine, almost wooley, winter undercoat. It has a naturally long tail, generally carried low, with a slight white tip. An ACD in good condition should weigh roughly 35 to 50 pounds (16 to 23 kg). Some breeders dock ACD's tails. This is a controversial practice and, in some countries, is illegal or is prohibited for show dogs. Docking Australian Cattle Dogs' tails is a practice peculiar to the United States, and is most often found in mixed- or pet-bred dogs -- ACD tails are not docked in their country of origin, Australia. The ACD needs its attractive tail for balance and steering while working or in agility. It is widely believed the tails are docked because of the mistaken notion that the dog will get its tail caught in doors or mouths of irate livestock. This is not to be confused with the Australian Stumpy Tail Cattle Dog, a square dog which is born with a naturally 'bobbed' tail; this animal strongly resembles the ACD, it should never be confused with the ACD. The ASTCD appears to have a taller, leaner conformation. An ACD finding a scent article as part of obedience competition. Like many herding dogs, Cattle Dogs have high energy levels and active minds. They need plenty of exercise and a job to do, such as participating in dog sports, learning tricks, or other activities that engage their minds. Some individuals find repetitive training frustrating and dull, so owners should aim to make training sessions varied and more exciting in order to keep their dog interested. Cattle Dogs who do not receive the appropriate exercise and entertainment will invent their own, often destructive, activities. These dogs are, by nature, wary. They are naturally cautious, and grow more so as they age. 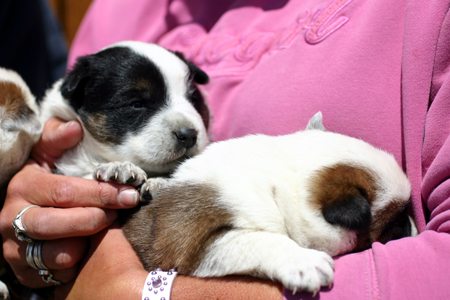 Their cautious nature towards strangers make them perfect guard dogs, when trained for this task. Cattle Dogs drive cattle by nipping at their heels, but they have also been known to herd other animals, such as ducks, chickens and flocks of ground-feeding parrots without instruction when left to their own devices. To relieve the urge to nip, the ACD can be encouraged to pick up and chew a toy or stick that is thrown for them. The ACD, given a toy that would last another dog for an extended time, will happily sit down with the object between its paws and skilfully shred it into small pieces. An ACD will remove the fuzz from a tennis ball as neatly as it would skin a rabbit. Any toy left with the ACD needs to be extremely robust if it is to last. ACDs need and enjoy any activity, such as diving and swimming.The ACD is gregarious to other dogs with whom it is familiar, working well in combination with other ACDs, Kelpies, and Border Collies. Because of their plucky nature, the establishing of an order can result in a few scuffles and bites. It is important for an owner to quickly establish a hierarchy in which they are the dog's pack leader, otherwise the young ACD may bond to a senior dog, rather than to its owner. As an urban pet, if the young ACD is allowed to bond too strongly with some senior dog in the neighbourhood, it can be very difficult for the owner to then establish control. With unknown dogs, particularly males, the ACD can be aggressive and fearless. Australian Cattle Dogs not only tolerate a high level of physical activity, they almost demand it. Like many other herding dog breeds, they have active and fertile minds that turn mischievous if not properly channeled. ACDs are highly intelligent and can be very bossy. When not active, an ACD can be kept occupied with mental puzzles. Among the most popular activities for Australian Cattle Dogs is dog agility. While the ACD is ideally suited for this work, since it is a herding breed and thus very reactive to the handler's body language, some ACDs become easily frustrated at the repetition and routine necessary to hone agility skills. As for many breeds, frequent brief training sessions are more effective than infrequent long training sessions. For this reason, many handlers find training an ACD to be challenging. 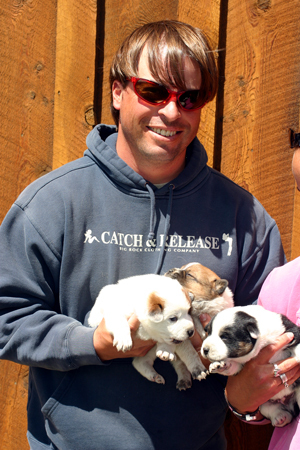 It is important to always change the methods and exercises and not allow the dog or handler to get into a rut. ACDs thrive on change and new experiences. Only a few ACDs, therefore, have excelled in obedience competition For example, the American Kennel Club awards an "Obedience Trial Championship" (OTCh) to the dog-and-handler team that defeats a large number of other teams in open competition. A handful of ACDs have reached this level. While ACDs enjoy the challenge of obedience competition, such as retrieving a scented article, the majority of ACDs are easily bored with precision drilling. ACDs are expert frisbee catchers, with just a little work they can master this activity and enjoy it for a lifetime. assorted "dingos" in " The Earthling (1980)"
Located In Park City Utah Sharon and Franks Heelers are well know to cowboys and families every where. After four generations the dogs today are the best yet. Contact us today for pictures.